After selecting Download Now above click the "Play Now" button to start then follow the 3 simple steps below to get started. For a full details on how to claim your bonus see our Full Tilt Poker Bonus guide. 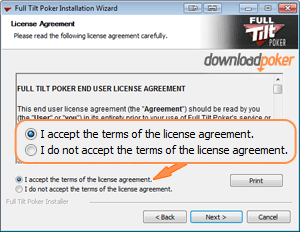 Click on Download Now to go to the Full Tilt Poker download page and follow the instructions below. 1.1 – Hit the “Play Now” button and then Click on the “Run” button to start the download process. 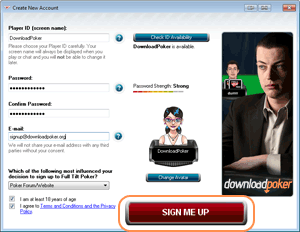 After the software has installed then you can create your own account, choosing your nickname that you will be known as at the poker tables and also the Avatar to represent you. Now you have signed up you can claim your free first deposit bonus – that’s up to $600 completely free as a gift from Full Tilt Poker. Just make a deposit and whatever your deposit Full Tilt will match it as a gift. 3.2 – Choose a deposit method and make your first deposit – remember whatever the amount of your first deposit – Full Tilt will double it automatically for up to $600 Free! 3.3 – That’s it – All Done. Now just select Real Money in the lobby and choose the table to sit down at and get playing poker! 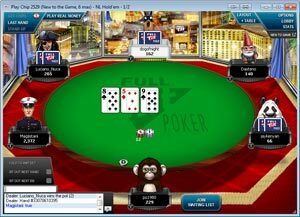 If you are having any problems getting started with Full Tilt Poker then please do not hesitate to contact us and we’ll be only too happy to try and help you out. 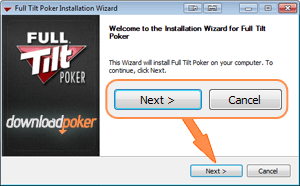 Downloading Full Tilt Poker onto your PC, laptop or Apple Mac is as easy as clicking a button. Everything is done for you and all you have to do is follow the easy instructions given to you. First of all click on Download Now which will take you to the software download page. From there click on the big red round button with “Play Now” written in the middle of it. A pop up may appear asking you if you want to accept the file download. Once accepted the file will automatically download to a destination of your choice on your computer. Normally this will save to the Downloads folder on your computer. For Apple Mac users the software download page will automatically detect you are on a Mac and download the correct version of the software for you. Once downloaded, find the file called “FullTiltSetup.exe” and open the file. You will be asked to select a language and then you can then proceed through the screens by clicking on the “Next” button. You will be asked to accept the terms of the license agreement which you do so by ticking the check box after which the “Next” button will become active and you can continue on to select the Install button on the following screen to start the installation. The destination of where the program will install to will automatically be selected, but this can be changed by clicking on the Change button and selecting a different destination on your computer. After a few minutes the installation will be complete and you will be given the choice to launch the Software when clicking on the Finish button. If you choose not to launch Full Tilt straight away, there will be a shortcut icon put onto your desktop where you can enter the Full Tilt poker room at any time. 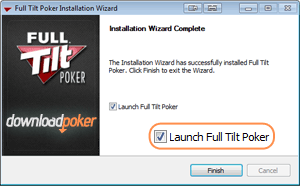 When you launch Fill Tilt poker for the very first time you are presented with three options. The first option is to create a new account, the second is to watch a table which allows you to go in and view any tables currently in progress. The last option is to log in with an existing account which is for players who already have an account set up. To create an account you select the big red “Create New Account” button from which you will be presented with the new player signup form. The first field you need to complete is the Player ID. This is the Screen Name that you will play under that all opponents will see. Once you have entered your preferred Screen Name click on the Check ID Availability button next to it to see if the name you have chosen is taken by another user. If it has, you will be presented with available alternatives or you can re enter another name and try again. You will then be asked to enter a password and re-type your chosen password in the next field. You have to do this because you cannot see what characters you are entering in the password fields, so this is to prevent you from making any mistakes. If the passwords do not match you then know you have hit the wrong key some where within the password, so its best to retype the password again in both fields. Once you are happy with your password enter a valid email address in the next field. You can then select your Avatar which is the character that will appear when ever you sit down at a table. You can change this again later so don’t worry too much if you are undecided. Make sure you have clicked on the two boxes where you confirm you are over 18 years of age and that you agree to the terms and conditions. Once done hit the red Sign Me Up button at the bottom of the screen. 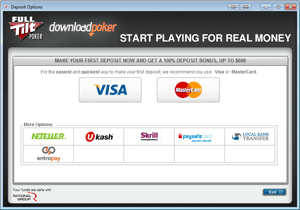 You have now created your FullTilt Poker account but a screen will pop up which asks you to validate your email address. 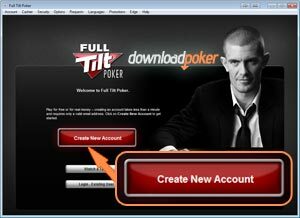 To do this open your email account which you have entered onto your Full Tilt account details and you should have received an email from the Full Tilt Poker support team. This will contain your validation code. Copy and paste this code into the space provided and click on the red Validate button to continue. Validation codes are valid for 24 hours and you can get another code resent to you by clicking the blue “Resend Code” link. 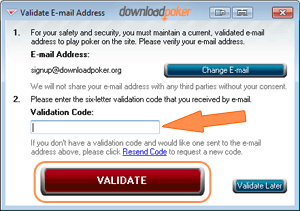 When the email validation code is accepted you will now have a live and active account and be ready to play poker. 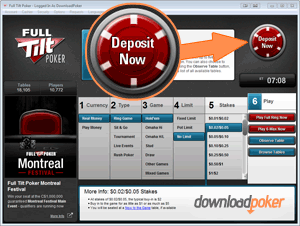 The only step left now before you can start to play poker is to make your first deposit. To do this click on the large red “Deposit Now” button in the top right of the lobby screen. FullTilt accepts all major payment methods, so select your preferred option and follow the instructions on screen to make an initial deposit. Remember that you can get up to $600 free on top of your first deposit if you have downloaded the software via the links on this website. Whatever amount you deposit Full Tilt will match with a bonus so deposit $600 and get another $600 for a total of $1,200 or any other amount below $600 will be matched in the same way. You won’t be able to just cash out your bonus amount straight away and in your bonus will be released to you in stages as you play poker. This is a fraud prevention method to ensure only genuine players benefit from the bonus. Full details can be found in our Full Tilt Bonus Guide. Once you have made a deposit and have some funds in your account balance then go back to the lobby screen. You will first be presented with the simple version of the lobby where you make a series of choices and let the software find you a table. You can also select the “advanced” view which provides you with a full list of tables for you to browse through and select from. Click on “Real Money” and then complete the other selections to Type, Game, Limit and Stakes that you wish to play. Once a table has been selected you can choose an empty seat to sit down at and select the amount of your bankroll that you wish to sit at the table with. Now all that is left is to play poker. The software is very intuitive and you should have no problems knowing what buttons to press to take the actions you want. Good Luck!